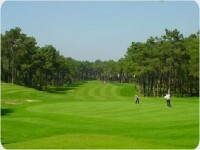 Located within comfortable driving distance of Lisbon the course is situated in an area of pine trees. The first hole is a par-4 that demands a very accurate second shot as a water hazard waits to the left and a large bunker to the right. Two other holes worth a special mention are the eleventh and the fourteenth. 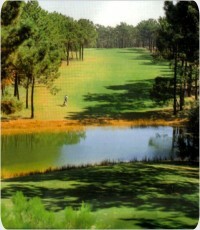 This course is a favourite location for Portuguese tournaments and charity events, and has twice hosted the Portuguese Open. Drive out of Lisbon to the south on the A2 (IC3) to Setúbal. Immediately after crossing the bridge take the first slip road to the right to Costa da Caparica and drive west. At the second traffic lights turn to the left and then follow the directional signs with the word "Golfe".